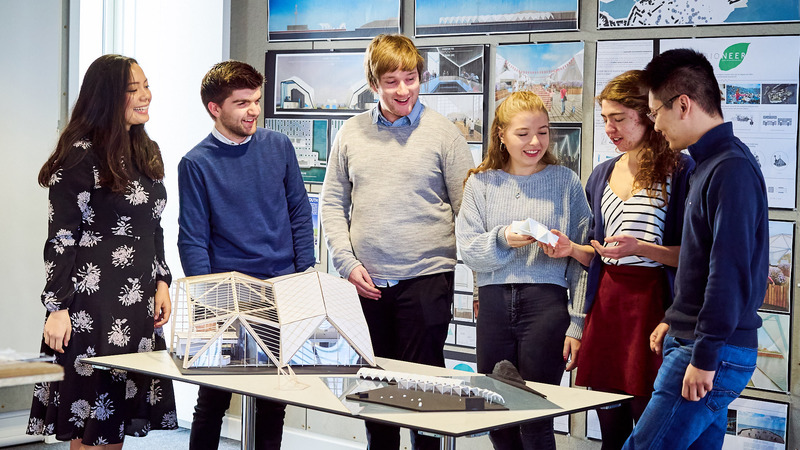 Architecture students Matt, Helen and Emma, and civil engineering student Zach produced a bold design solution for their 2016 Basil Spence winning project. 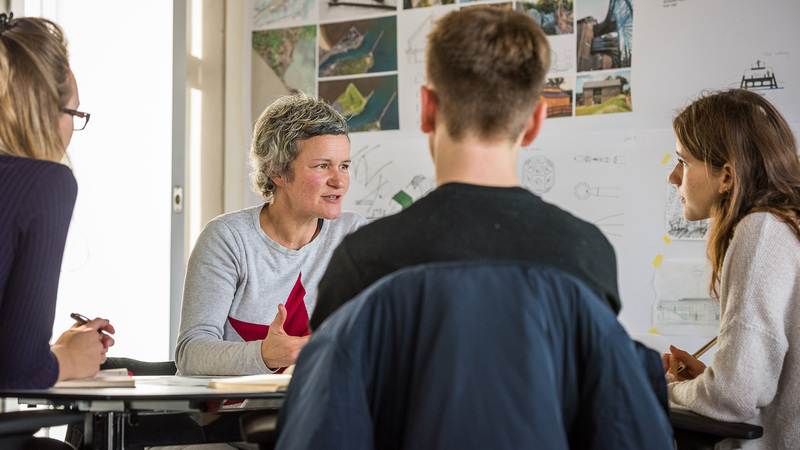 Our flagship design competition, the Basil Spence Project, brings together architecture and civil engineering students to work on a brief as they would in the workplace. This year's project challenged them to design a railway station for Oxford. The design had to offer mystique and splendour to commuters and serve as a physical and social catalyst of renewal for the city. 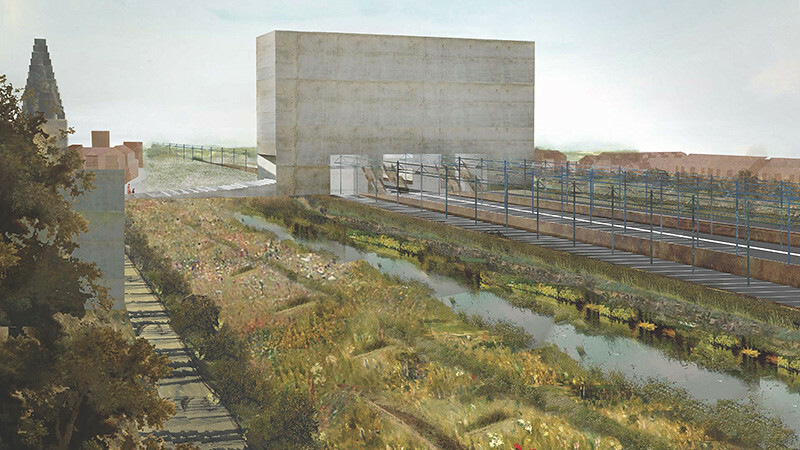 Helen, Matt, Emma and Zach's winning 'concrete box' design encompasses an exhibition space, hostel, bar and studio space. Positioned on the west side of Oxford's Frideswide Square, the station acts as a gateway to the city centre and a transition point between the residential west and commercial east. Small slits in the north-facing façade of the station provide a home for hibernating butterflies to emerge each spring and an artificial wildlife corridor on the North-South axis is filled with native species to encourage foraging and migration. Drainage channels, inspired by ancient Saxon methods, and soft landscaping help to reduce any flooding of the site. The students were encouraged to be brave throughout the design process. Helen says: "If ideas felt that their only justification was being the obvious or easiest solution, we wouldn’t accept them. In week two of the project, our proposal began to be referred to by tutors and colleagues as something 'bold'. A building of this scale, standing out in its context, is not something I believe would have been our initial idea had we been working alone. The reaction to this risk-taking approach was more often than not positive and something we were commended for." The team drew inspiration from existing buildings. Like the simple elegance of Bruderklaus Chapel in Mechernich, the station is bold enough to make a statement, but not intimidating or overbearing. Drawing upon São Paulo's SESC Pompéia's separation of circulation and function, the design evokes a sense of wonder for commuters as they journey through the building via floating staircases and across bridges into the central atrium. The design contains vast, empty spaces to maximise the use of light, similar to the Tate Modern's turbine hall. Rather than introduce windows to an introspective building, the team developed four different types of 'opening'. Inspired by the Unité d’habitation's modular system, the 'openings' create smaller, more intimate spaces within the monolith structure. Gears and handles move external concrete panels coupled with internal timber panels to create a ‘living’ wall. These flexible private and communal spaces reflect the personal places of contemplation and fascination books create for their readers. This also changes the building’s appearance from hour to hour, and day to day, depending on weather and lighting conditions. "The building has moments of intrigue, fantasy, and adventure within the rigid concrete structure," says Matt, "we wanted to create a monument to Oxford’s literary heritage so we often returned to a quote by C.S. Lewis about the importance of the Form itself whilst we were designing." Over eight weeks, the team experimented with their ideas, often casting their designs in concrete to detect flaws and make improvements. Each member took on different roles with Helen leading on building the 3D models and Zach calculating structural requirements. Civil engineer, Zach found working with architecture students a useful experience: "It was wonderful to see how people with different specialisms approach the same design challenges. I developed my ability to come up with radical solutions to challenging problems that encompassed not only innovative and honest engineering, but fitted with the architectural intent of the project. I am really proud of this project and believe it represents a perfect culmination to my university education." Having a civil engineer involved in the project was something Matt really enjoyed: "In Zach, we not only had an incredibly gifted engineer, but a talented and immensely passionate designer. He contributed greatly to every single aspect of the design process, while also producing an amazingly thorough engineering solution to our scheme. His positive outlook on the project and eagerness to push the boundaries of his knowledge have produced, in my opinion, a unique and innovative solution to a complex brief." Take a closer look at the team's designs for Oxford Station. Read more stories about architecture and civil engineering group design projects. The 2017 Basil Spence winning design made use of an innovative new material to encourage a culture change away from single-use plastics. Cross-discipline project work prepares our students for the professional team relationships they will experience in their careers. From Oxford station to Waterloo station. 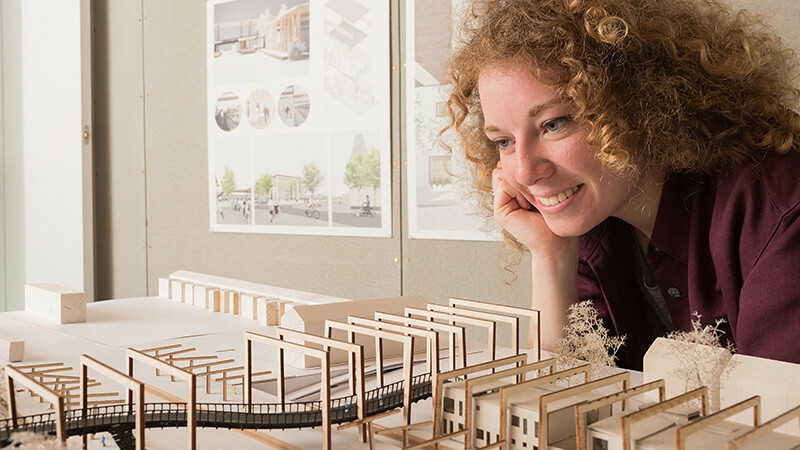 After working on our flagship design project, the Basil Spence competition, Gemma Andrews is ready to begin her career.